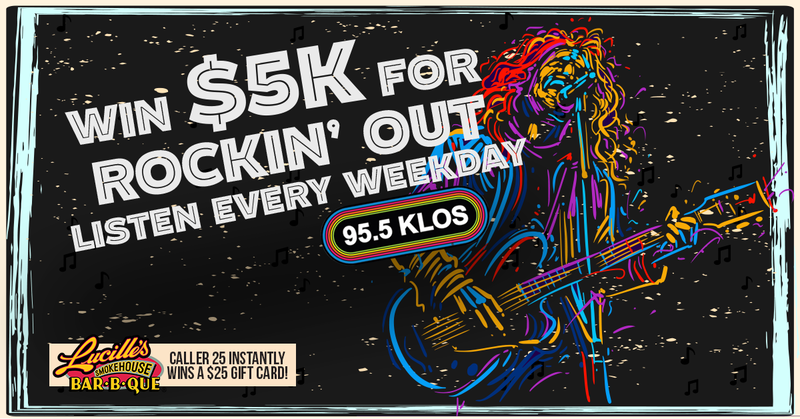 Each weekday, KLOS will announce the $5K Band of the Day numerous times throughout the day. When you hear the $5K Band of the Day during the 9am, 11am, 1pm, 2pm, 3pm and 5pm hours, caller 25 at 800-955 KLOS will instantly win a $25 Lucille’s Smokehouse BBQ gift card and qualify to win $5,000 every Friday afternoon until February 22nd. Gary Moore will announce a $5K winner’s name each Friday between 5:15p and 5:45p. If you hear your name, call 800-955-KLOS within 10 minutes and you win $5,000.